When it comes to outdoor viewing, there are several factors to consider in order to get the best experience. A quality scope should be able to offer a clear, magnified image without loss in color or detail, and it must be able to withstand the demands of its environment. The Pentax PF-65ED is lean on price without having to give up key features. Consider it for your next spotting excursion. While the price nearly summits the $600 mark, this scope is modestly expensive compared to competing models. In order to maintain affordability, the Pentax PF-65ED relies on providing a natural image without unnecessary technology. For outdoor enthusiasts, a spotting scope can be vital and must perform consistently at high levels. Perhaps the most important feature for a spotting scope is clarity. Using porro-prism optics, the Pentax PF-65ED delivers a vibrant and crisp image. Porro-prism is great for image quality, but usually lacks the durability that can be found in roof-prism optics. * This is not the case with this scope, which features a waterproof rubber housing that protects the scope and allows for viewing in wet and hazardous conditions. Featuring a tripod and a total weight at just over 2 lbs., aiming and carrying this scope are effortless. This scope can be mounted and securely locked onto the subject in just a few short moments while displaying a generous field of view. 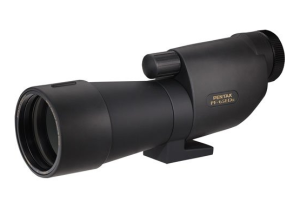 Pentax is famous for rifle scopes, in which ease of use and clarity are essential. This spotting scope delivers on that platform while also providing broader vision at a 65mm zoom. While Pentax offers a wide array of quality scopes with impressive features, the Pf-65ED is able to deliver impressive results at a more affordable price. Pentax has products that are built for backyard bird-watching to spotting rare animals in exotic and unforgiving climates. This scope shines brightest by being perfect for hobbyists and professionals alike. Part of what makes this scope so brilliant is that it can’t do everything, and it’s not designed to just do one thing. By allowing itself to fit into several situations, the PF 65-ED can be the only scope you’ll ever need. This is an eyepiece that lends itself to everyone. Because of the durability and high-performing features that work rain or shine, you can take this scope almost anywhere. No more worrying about the weather, because the PF 65-ED was designed with weather in mind and transitions seamlessly between rain torrents and bright sunshine. Pentax has priced and designed this model to offer something across the spectrum of outdoor optics. The right amount of emphasis is placed on every aspect to ensure that this scope works dependently and that there aren’t any areas of shortcomings. Confidently take this scope on a week-long excursion to an unfamiliar climate, where you may not even know what it is you want to see. When you’re out in nature, you’re surrounded by possibility and opportunity. The Pentax PF 65-ED is the scope you want with you to ensure none of those possibilities or opportunities pass you by.